If you have an adventurous spirit and want to try one of the best sports in the world, surf with Douro Surf Hostel! 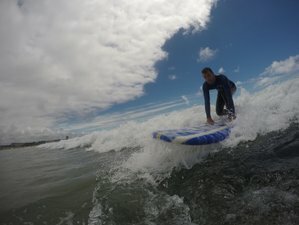 Join this an amazing experience where you will practice surf in one of the worlds’ best places. Come and discover this beautiful paradise, and learn to surf with a certified and experienced teacher. Find your perfect waves, and get the most out of your surfing holiday! Come and discover this beautiful paradise, and enjoy the thrill! During the surf camp, you will stay at Douro Surf Hostel. It is situated in the historical Gaia, which includes the Douro landscape, classified as a World Heritage Site. It is surrounded by Porto wine cellars, just a two-minute walk from the Douro river and the Dom Luis I Bridge. It is a typical Portuguese building, completely renovated with surf soul and decor, relaxed and calm, perfect to chill after visiting the city or going out to a party. Douro Surf Hostel is a three-floor building, which one with private kitchen and W.C. It has two dorms and two private rooms. All the dorms have individual lockers and individual lights. They also have a common room, where you can meet and mingle with other guests. Free Wi-Fi is also available in every place of the hostel. There is also a luggage store where you can keep your luggage for free, even after you check out. Palm room is located on the first floor of Douro Surf Hostel. It is a couple room or double room (you can choose between two single beds or one king-size bed). This is the most romantic space of Douro Surf Hostel. Each bed has one individual light to read and a safe zone to save your things. Associated with this room, you have a kitchen and a WC shared with another private room. Sun dorm is located on the second floor of the Douro Surf Hostel. It is a six-bed mixed dormitory. Each bed has one individual light to read and a safe zone to save your things. This dorm has a private balcony where you can appreciate the landscape of Porto city and Port wine cellars. This dorm has a private bathroom and kitchen. During the surf camp, you will have two surf lessons, guided by a certified teacher from Portuguese Surf Federation. You will also have a Douro cruise experience, where you will navigate through the river in a typical Rabelo Boat by an hour and discover the beauty of Douro River. On this cruise, surprise yourself admiring the six bridges that make the connection between Porto and Vila Nova de Gaia. You can see Ribeira, Dom Luís I Bridge, Serra do Pilar monastery, Infante Bridge, Maria Pia bridge, Saint João Bridge, and Freixo Bridge. Coming from Saint João Bridge, you can admire the gorgeous city of Porto, the World Heritage Area since 1996. After passing Dom Luís I Bridge in direction to the ocean, you can not miss the beautiful land of fisherman, Afurada town, with a serene beauty of river and ocean together. It seems like something special, making part of only one life. During the trip, you will enjoy a spectacular river cruise along the Douro River. Douro Hostel and Surf School is located near the Porto's city center. It is located in Vila Nova de Gaia, just two minutes walking from Douro river and D. Luiz bridge. There is also a subway, train, bus, and taxi station nearby, which can be in reached less than five minutes by walking. You will be served daily breakfast during the surf camp. Please book your flight to arrive at Francisco de Sá Carneiro Airport (OPO). Douro Surf Hostel have shuttle service that can take you directly from the airport to the Hostel! If you want it, please contact them. Douro Surf Hostel is the best option to create memories in your holidays at Porto. We offer Surfcamps, Surf and Wakeboard classes or Douro River cruises.